If you're in the mood to toss practicality to the side and layer up all things pretty, you've come to the right spot. Spring is in the air, and it finally feels like we can put a proper outfit together and pile on all of our favourite things. Which is why I'm in the mood for some new accessories. Ones that I don't necessarily need, per se, but serve the purpose of reviving my love of getting dressed and sparks some joy into my spring wardrobe. Do I need a straw beret, a pearl headband or a satin bag right now? Practically speaking, maybe not, but I do love them and that's enough for me. These accessories don't need a reason for being in one's wardrobe other than the fact that they are just plain adorable. Keep scrolling for the new season bags, jewellery and other accessories that are too pretty to miss. Beaded, flower-shaped and made of pearls. This speaks for itself. Literally sunshine in a (satin) bag. A timeless and iconic shape in a gorgeous print with pink trim. I'm not crying—you're crying. 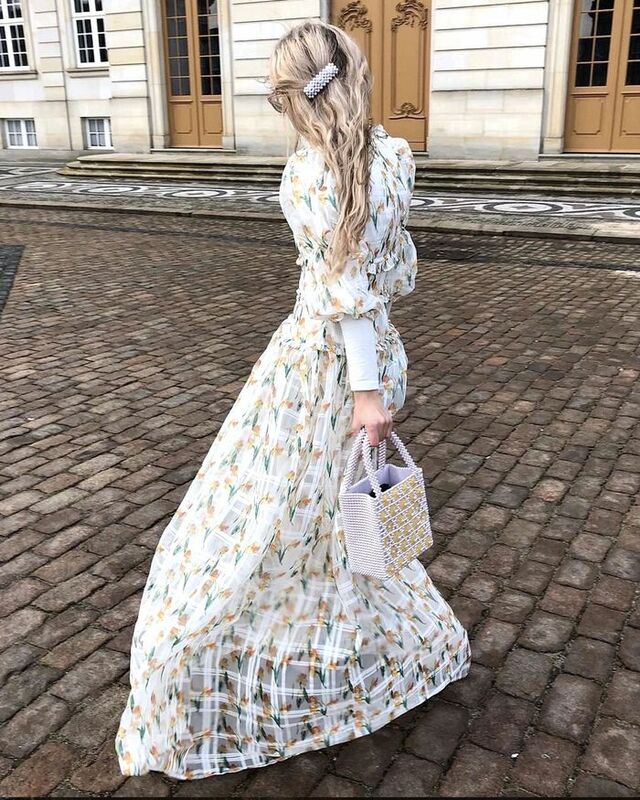 This feels like a formal yet beautiful day version of the basket bag. I love the vintage vibe it's giving me too. Wandler bags are a fashion-week favourite, and this just shows you why. A polka-dot satin bag with a bow. Enough said. If the floral print, the trim and the heart shape weren't enough, these bags come with matching dresses too. Toting around a huge bag can be this cute. Simone Rocha's pearl slides launched one of the biggest hair trends of 2018, and it still reigns at the top this year. I love the addition of the red beads. This with an oversized white button-down shirt in the summer (with a glass of sangria) would be perfect. When we saw these come down the S/S 19 runway, we knew Prada had just brought back the OTT headband. Pink satin? Yes, please. You don't have to wear them all at once, but that could be fun too. Okay, so I have Simone Rocha addiction. She's started making these headbands, and I thought you'd want to know. 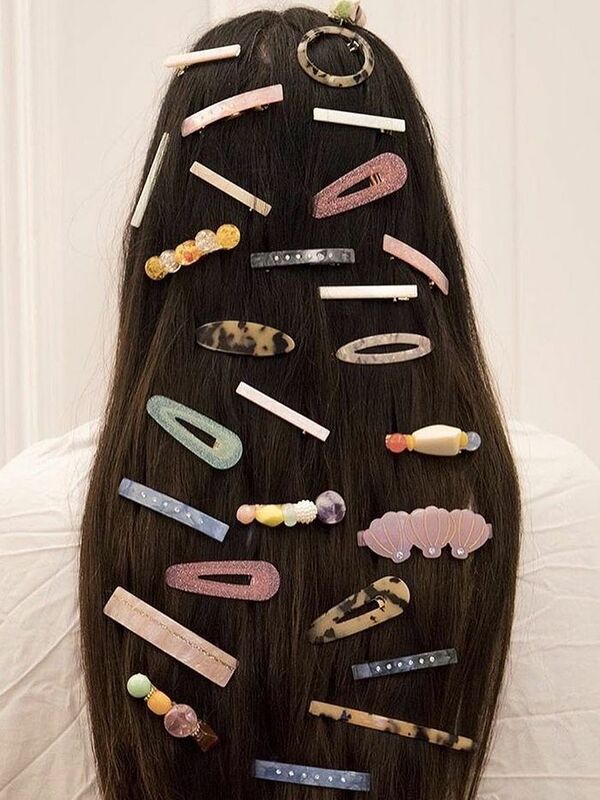 Hair accessories are having a moment, and it's clips like these that are to blame. There's nothing that will make you sing "I Feel Pretty" like a big, pink satin bow. These pearl earrings are basically a party on your ears. With every step, they dance! With the costumes from the movie The Favourite as my style inspiration, I intend on feeling a bit more like a queen this year. I think this necklace will help me achieve that. Crystal jewellery is on the rise this year. With these on, your face is Versailles and these are the chandeliers. Proof that something simple and timeless can be pretty—just be ready for an inundation of compliments. Anklets regained popularity last year and will likely not be going anywhere. This pearl version is the perfect 2019 update. Layered or on its own, this is an unabashedly wonderful love necklace. Don't wait around—buy it for yourself! Imperfectly perfect. I have a pair and I feel like I'm in Sofia Coppola's Marie Antoinette every time I put them on. Small but mighty beautiful. Weekday is my not-so-secret secret spot for high-street hoops. This is not just a polka-dot neckerchief—it's pleated! It doesn't get better than seeing the world through rose-tinted glasses. This new brand is going to be a favourite. Prince would so write a song about this beret too. Once again: Tortoiseshell is pretty. In the making of this article, I've realised we all need more pleated neck ties in our lives. Especially one that makes you feel like Jackie O in the Florida Keys. Something about this peachy champagne colour is so tempting. Maybe with a coral lip? At this point, this will be a season of scarves. Think Gwyneth Paltrow in The Talented Mr. Ripley. I can't wait to pair this with a white one-piece in the South of France (glass of rosé in hand).